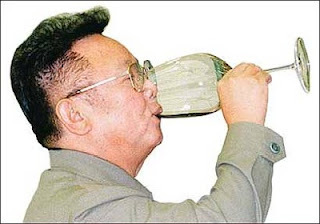 ~ Hereditary leader of reclusive North Korea, Kim Jong Il, toured various facilities in his country recently, including the Solar Equipment Centre, which is building solar hot water heaters "on a trial basis." According to the press release, he was pleased with the work of the Centre, and appreciated the building's various features, including rain water collecting, a wind turbine, and solar energy harvesting. He "stressed the importance of the use of renewable energy sources." How long will it be before some wingnut uses the support of Kim to attack renewable energy? According to [Korean Central News Agency] KCNA, Kim Jong Il, General Secretary of the Workers' Party of Korea and chairman of the DPRK National Defence Commission, provided field guidance to the newly built Solar Equipment Centre. The centre built in a picturesque place in Mangyongdae area is a modern base specialising in the development, production and supply of solar energy equipment. Going round the solar water heater production base ready to go operational and the main building and other places of the centre, he learned about its construction, technical specifications of equipment and prospect of their production. Watching solar water heaters produced on a trial basis, he said that their mechanism is simple and very high in heat-accumulating capacity. He noted with pleasure if these heaters are installed in dwelling houses and public buildings, this will make it possible to solve the issue of heating buildings and help people use hot water all the year round, the agency reported. Going round inside and outside of the main building constructed in such a way as to ensure heating, lighting and the supply of industrial water by use of solar water heater, wind power generator and rainwater-collecting tank, he highly appreciated the exceptional creative spirit displayed by officials and employees of the centre in the successful construction of the energy-saving building on the basis of latest science and technology. He set forth tasks to be carried out by the centre. He called on the centre to actively develop and use renewable energy such as solar heat. What is important is to conduct brisk activities to mass-produce solar water heaters and supply them on the basis of the existing production foundations, he added, according to KCNA. Not surprising that hot water all year round is not now the norm in a country where many are forced to eat grass in an attempt to survive.